Hawkwind agree to meet SNTB for photos! Yes it’s true, Hawkwind have agreed to meet up with SNTB for once in a lifetime photo opportunity. As a big thank you we will now unreservedly be promoting all things Hawkwind. 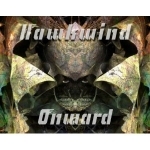 For information about all things Hawkwind, and to view the current tour dates please visit their website. Congratulations! SNTB goes from strength to strength. A beacon to us all. I must make the effort to get over there and check out this love tunnel. Robert Calvert’s Connection with South Norwood is that he lived at 7 Oliver Avenue until 1956 when the family moved to Cliftonville, Margate. I was a friend of his brother Derek.